Custom Horse Bottle Opener Keychain Personalized in Bulk. Inexpensive, Promotional. Best price in the USA and Canada. 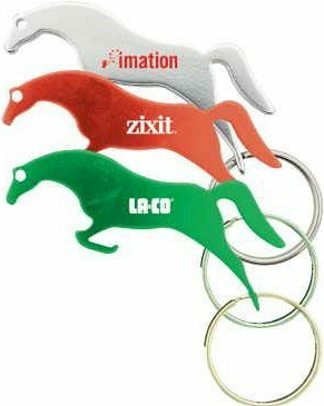 We supply bulk horse shaped metal bottle opener key rings, personalized with your logo. We also supply wholesale blank (not imprinted) horse bottle opener key holders for only $0.75 each and direct import horse bottle opener key holders at lower prices (please scroll below our regular Price Table to see the lower factory direct prices). Budget Prices in the USA and Canada for bulk horse bottle opener key holders . American clients pay no taxes, Canadian clients don't pay PST. We will send you a proof for your approval before production. Free artwork design. Price includes a 1 color, 1 side imprint. Set up charge is $40 for all orders. Additional colors/locations are $0.06/color/location, plus a $40 set-up charge/color/location. Typical Production Time: 12 days; contact us for faster delivery. Please multiply all the US prices by 1.30 to get CDN$ prices.